Researchers have identified six genes that predispose carriers to develop the brain tumor medulloblastoma and have used the discovery to craft genetic counseling and screening guidelines. The study appears today in the journal The Lancet Oncology. St. Jude Children's Research Hospital, Hopp Children's Cancer Center at the NCT Heidelberg (KiTZ), Germany, and The Hospital for Sick Children, Toronto, led the research. Medulloblastoma is the most common malignant childhood brain tumor and one of the leading causes of non-accidental death in U.S. children and adolescents. The tumor includes four main molecular subgroups with different clinical and biological characteristics as well as treatment outcomes. Except in rare cases associated with genetic disorders like Li-Fraumeni syndrome or Gorlin syndrome, medulloblastoma was thought to occur sporadically by chance, usually in infants and children less than 16 years old. But researchers completed apparently the largest analysis yet of genetic predisposition in a pediatric brain tumor and found that germline variations in six genes often play a role. The genes include APC, BRCA2 and TP53, which are also associated with an elevated risk for breast, colon, ovarian and other cancers. The findings led the researchers to develop screening and counseling recommendations for patients based on the medulloblastoma molecular subgroups—WNT, sonic hedgehog and group 3 and group 4. The newly identified predisposition genes account for about 20 percent of the sonic hedgehog subgroup and about 5 percent of cases overall. Germline variations are usually inherited and carried in cells throughout the body. "One in five patients with sonic hedgehog medulloblastoma had clear germline predispositions that put them and possibly their siblings at risk for developing medulloblastoma and other cancers later in life," said Paul Northcott, Ph.D., an assistant member of the St. Jude Department of Developmental Neurobiology. He and Sebastian Waszak, Ph.D., of the European Molecular Biology Laboratory, Heidelberg, are co-first authors. The contribution of germline variations in other medulloblastoma subgroups ranged from less than 5 percent in group 3 or group 4 medulloblastoma patients to about 10 percent of patients with WNT medulloblastoma. Overall, long-term survival is about 70 percent for patients with medulloblastoma, but ranges widely from 95 percent for WNT medulloblastoma to 50 percent for patients with group 3. "Overall, half the patients with damaging germline variations were not identified based on their family cancer histories, which clinicians have depended on," Northcott said. "That highlights the urgent need to make genetic counseling and testing the standard of care for some medulloblastoma patients, particularly those in the sonic hedgehog and WNT subgroups." Co-author Giles Robinson, M.D., an assistant member of the St. Jude Department of Oncology said: "The screenings can help patients and families understand and manage their lifetime cancer risk." Along with APC, BRCA2 and TP53, the other predisposition genes identified in this study were PALB2, PTCH1 and SUFU. The gene variations are predicted to change the encoded protein and disrupt the genes' normal function. To find the high-risk genes, researchers compared the prevalence of rare variations in 110 known cancer predisposition genes in medulloblastoma patients from three continents to individuals without cancer. The analysis included whole genome and whole exome sequencing data of 1,022 patients with medulloblastoma. 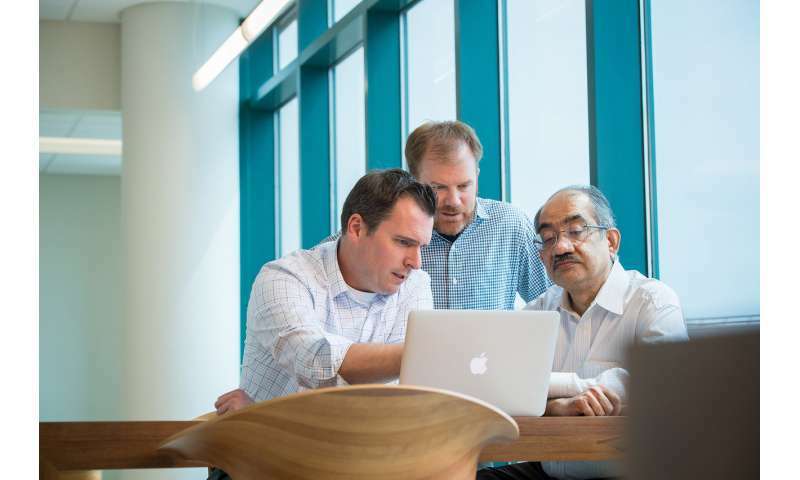 The exome is the portion of the genome that encodes instructions for protein assembly. The samples included tumor and normal tissue from 800 of the 1,022 patients. Investigators reported no significant difference in patients screened prospectively or retrospectively. The comparison group included exome sequencing data from more than 58,000 individuals with no cancer diagnoses. The findings led to the following subgroup-based counseling and screening recommendations. WNT—Genetic counseling about possible high-risk APC germline variations should be offered to certain patients with WNT medulloblastoma. Those are patients without tumor cell (somatic) mutations in the gene CTNNB1, which codes for the protein β-catenin. 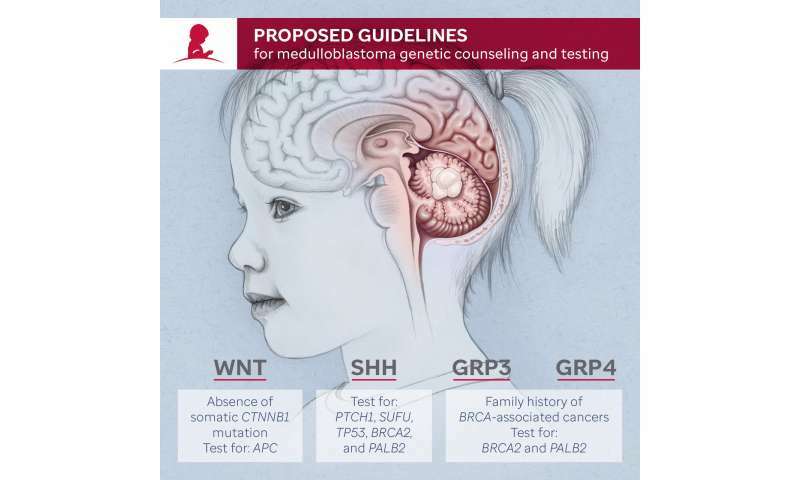 Sonic hedgehog—Genetic counseling and testing should be offered to all patients in this subgroup for some or all of the following genes: SUFU, PTCH1, TP53, PALB2 and BRCA2. The analysis also revealed that high-risk germline TP53 variations were a risk factor for medulloblastoma treatment failure. Group 3 and Group 4—These subgroups account for 65 to 70 percent of all medulloblastoma, but less than 5 percent of cases were associated with the cancer predisposition genes. Researchers recommend counseling and testing of PALB2 and BRCA2 in patients with family histories of breast, ovarian or other cancers associated with mutations in BRCA genes.